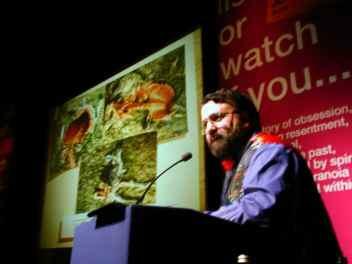 Peter Chapple, 48, well-known Australian cryptozoologist, died suddenly, on August 26, 2002 (local Australian time) at Dendenong Hospital, after suffering a heart attack. Peter Chapple was the President of the Australian Rare Fauna Research Association (ARFRA), in Emerald, Victoria, Australia, which recorded more than 2000 sightings of the Thylacine in Victoria alone. ARFRA was founded by Chapple in June, 1984, under the name “Rare Faune and Phenomena Research,” after he had an encounter that year with a “Big Cat” (cryptid panther) in the forest in the Dandenongs. The group became an incorporated association in 1993. Under Chapple’s leadership, ARFRA conducted extensive field-studies and compiled a large data-base on the subject of unidentified animals. One of ARFRA’s main achievements involved a 1980s study of panther reports in the Dandenong Ranges. Through a detailed analysis of information gathered over many years, Chapple and other researchers were able to predict the appearance of particular panthers in places where they had been seen in the past. This led to several close encounters with them and proved that the “Big Cat” phenomenon could be measured scientifically. In recent years, Chapple was concentrating on working towards his Masters of Science at Monash University, analyzing patterns of distribution of recent Thylacine sightings. Peter Chapple was a multi-talented achiever, having been a former runner-up in the South Australian Open Tennis Championship, and a well known singer and musician. Between 1985 and 1993, when Peter Chapple was entering eisteddfods, he won 38 events, and was placed in 57 others. Also in 1985, he was signed up with the Victoria State Opera. His first album, Whatever You Believe, was chosen as Album of the Week on radio 3MP in 1993. This was followed in successive years by One Voice, The Impossible Dream, and in 1996 by Peter Chapple Live. Chapple represented Australia at the Fifteenth International April Spring Music Festival in North Korea in April, 1997, and was placed first against extensive international competition. He also was a Principal Singing Teacher at the Australian Talent School in Ferntree Gully. Long before he reached school age, Peter Chapple found singing as natural as breathing, and already earned applause – from two girls he sang to across the road. At nine, he made his first public appearance, at a church concert. However, his early potential went unrecognized, and he worked alone on improving and perfecting his voice as best he could, by listening to tapes of himself and comparing them with recordings of the great singers. It was not until he was 28 years old that his singing career really began. At that time, with his career as a tennis coach ended by a serious back injury, he took up landscape painting, and revived his earlier interest in song writing – mostly folk, Country & Western and soft rock. It was when he took tapes of his songs to his art teacher, seeking an assessment of his songs from her opera singer husband, that his chance came. It was the voice, rather than the songs, that attracted attention. The singer, George King, provided him with lessons (gratis), opportunities to perform in public, and encouragement to audition for music theatre, where he played a number of principal roles. It was at this time also that he began entering eisteddfods. As noted above, Peter Chapple was the President of the Australian Rare Fauna Research Association, and enjoyed bush activities, golf, cricket, and, according to those that knew him dearly, watching his beloved St. Kilda blow their chances at the footy each year. With his inspiration, his beloved teacher-singer wife Rosemary, he lived at Clematis in company with two sheep – Sop(rano), and Sop’s quite unexpected offspring, Alto. Peter Chapple’s song-filled life and good spirit will be missed in the world of cryptozoology in Australia and worldwide.